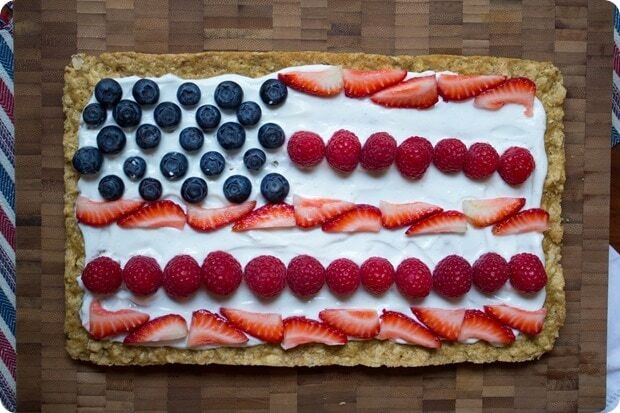 To my American readers: here is how to impress your 4th of July BBQ guests. 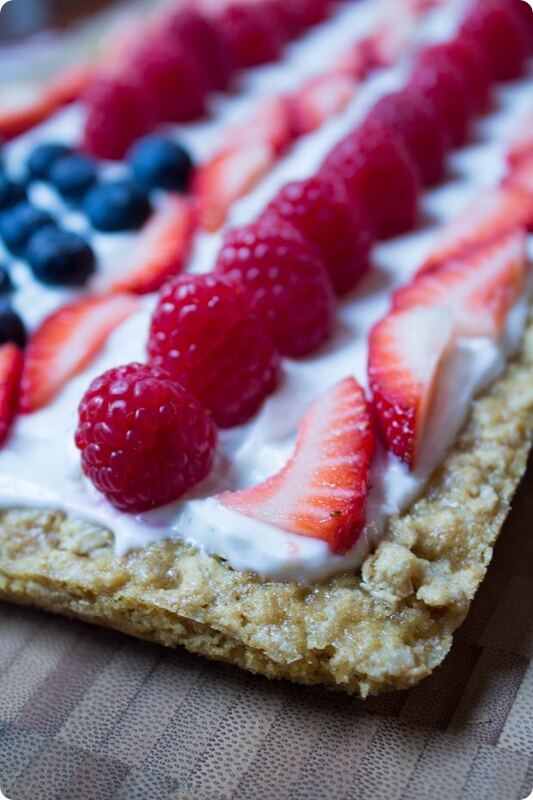 Introducing this adorable and healthy 4th of July cookie cake recipe. 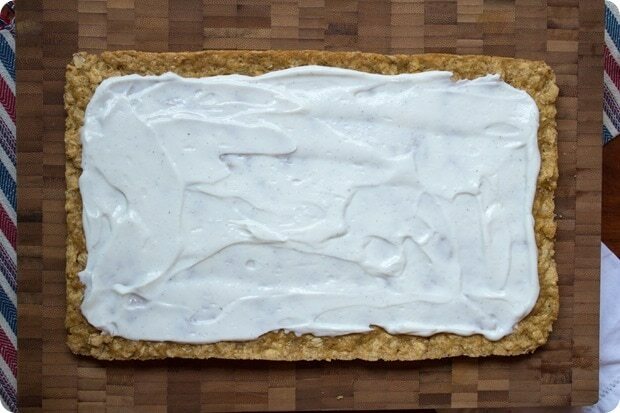 It’s packed with fiber from the whole wheat pastry flour (be sure to use pastry flour, not regular whole wheat flour) and oats and has a nice added vanilla punch without any extra sugar from Almond Breeze Almondmilk Unsweetened Vanilla. As for the icing? 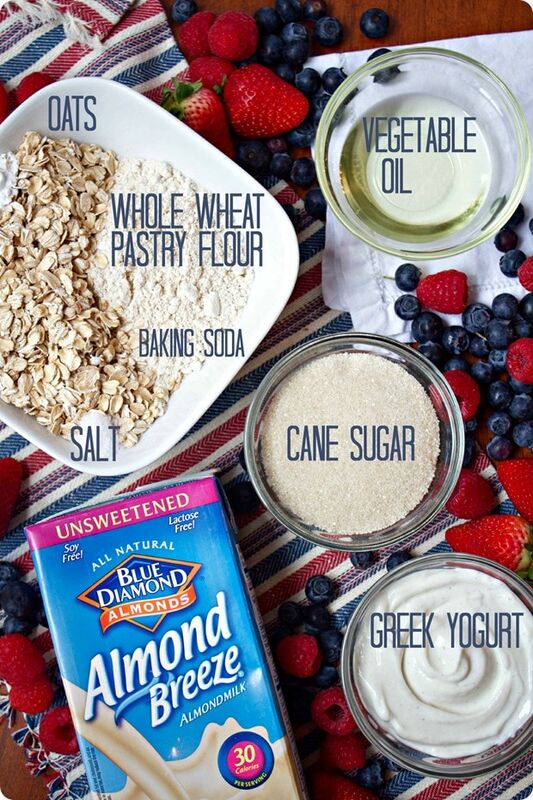 It’s actually just vanilla Greek yogurt, which makes this recipe super easy AND adds a nice protein punch to the mix. I call this a cookie cake because that exactly what it is: a mix between a cookie and a cake! 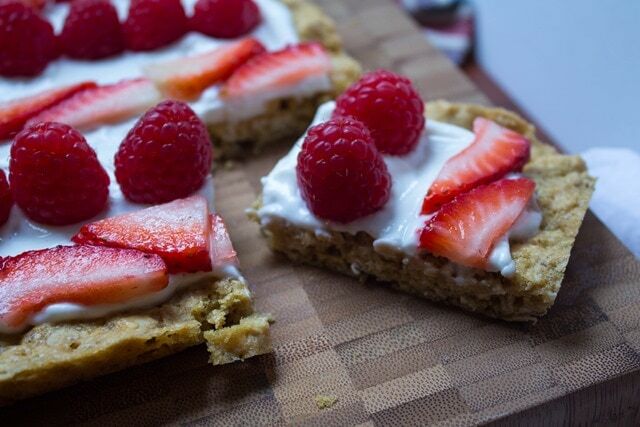 The texture and flavor is somewhere in between an oatmeal cookie and a vanilla cake; crispy around the edges, chewy but fluffy in the middle, and nice and vanilla-y. To make it, simply whisk together the dry and wet ingredients separately, then add the wet to dry, mixing gently until a dough forms. Then pat the dough into a baking pan, bake 25 minutes, and it’s ready to be decorated! Be sure to use vanilla GREEK yogurt – not regular yogurt – as your icing; the regular kind won’t be thick enough to stay put. I recommend full fat if you can find it, too. If you’re vegan, I bet a thick vegan yogurt would do the trick instead. With your blank canvas ready, it’s time to make your flag – or whatever else you like! Feel free to get creative depending on the season/holiday. 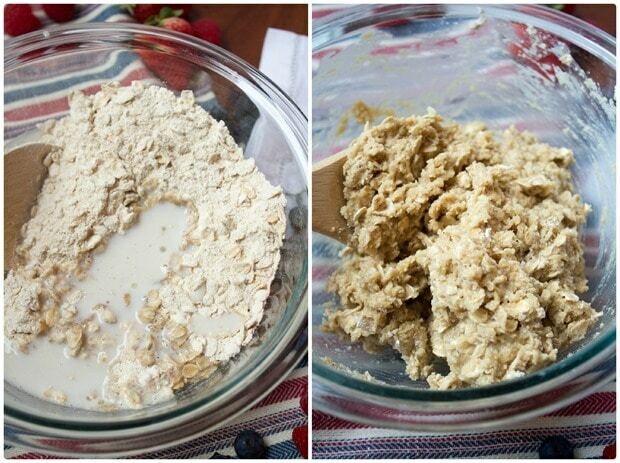 Whisk together the flour, oats, cane sugar, salt, and baking soda in a large bowl. Add the vegetable oil and almondmilk, stir until a dough forms. 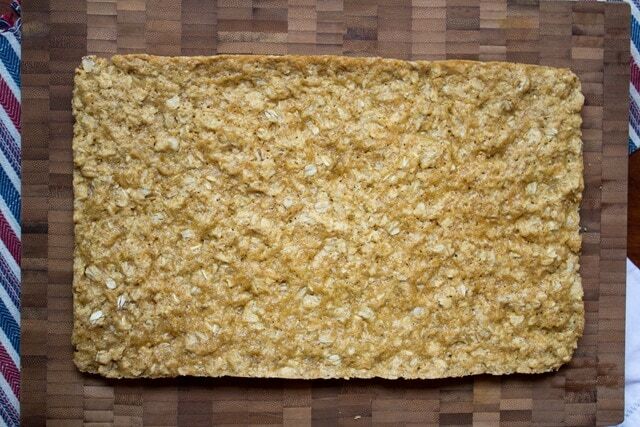 Pat the dough into a greased, foil-lined 11x7 inch baking pan. Bake for 25 minutes, until the edges are golden brown and the center is set. Allow to cool, then remove from the pan and peel back the foil. Spread the Greek yogurt evenly over the cake and top with berries. Have a wonderful holiday weekend, my friends! I’ll be taking tomorrow off, so I’ll see you back here on Monday! What’s your favorite 4th of July BBQ treat? 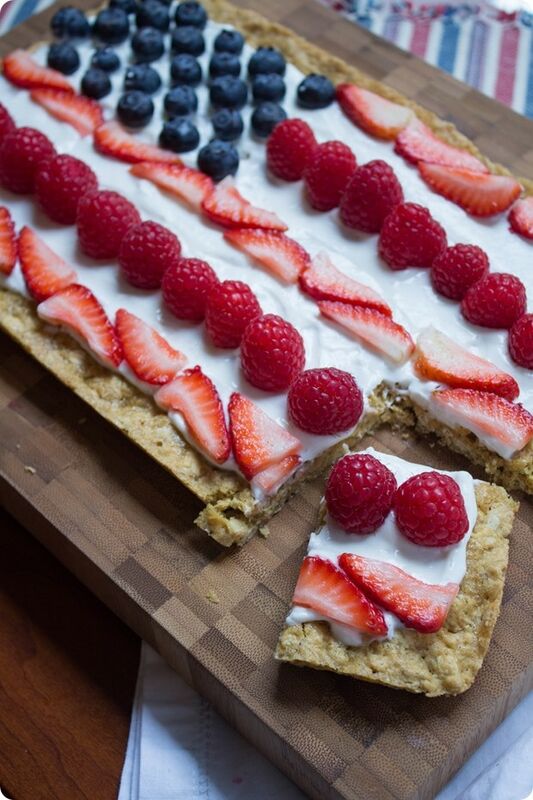 I share some more ideas in this post: Healthy 4th of July BBQ recipes. 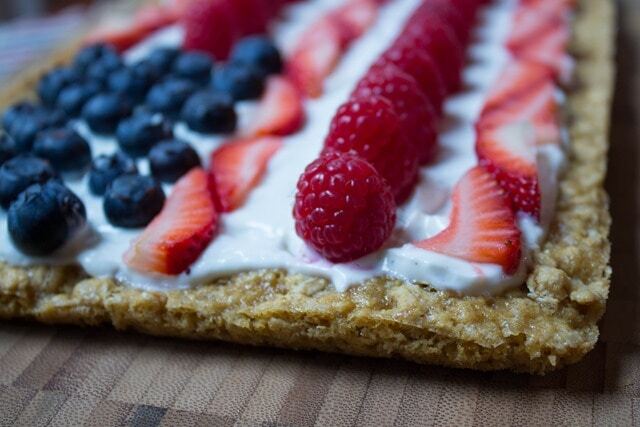 The patriotic strawberries at the end of that post are one of my all-time faves! YUM! I love these kinds of deserts! YUM! definitely want to make this. However I never can find whole wheat pastry flour. What is the difference between that and regular whole wheat flour? Pastry flour is a lot softer/lighter than regular whole wheat flour – it creates a less dense baked good. It’s basically a way to use all whole wheat but without your final product being super dense/gummy/intense. You can just use regular flour in place of it if you want. They sell it at Whole Foods – or you can just buy it on Amazon! This looks amazing! 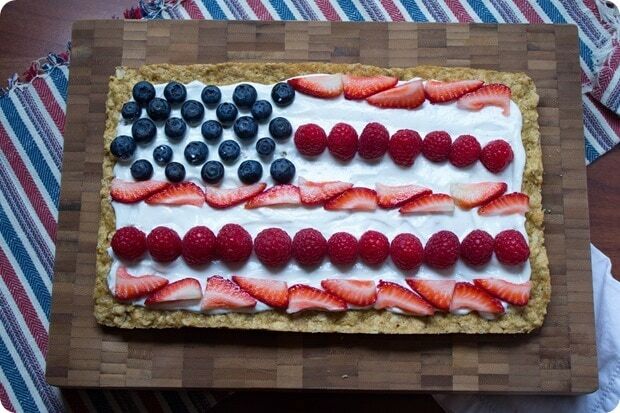 I am super excited to make this for the 4th. I too am having a hard time finding pastry flour. However, I did find cake flour (not whole wheat). Do you think that would help keep it less dense? If you can’t find ww pastry flour, I would just use regular all purpose flour! Enjoy! great, thank you! i only have fresh market near me but will try whole foods in atlanta this weekend! Beautiful photos! I love oatmeal cookies, and this looks like such a tasty twist on them that’s perfect for the holiday. Looks delicious! 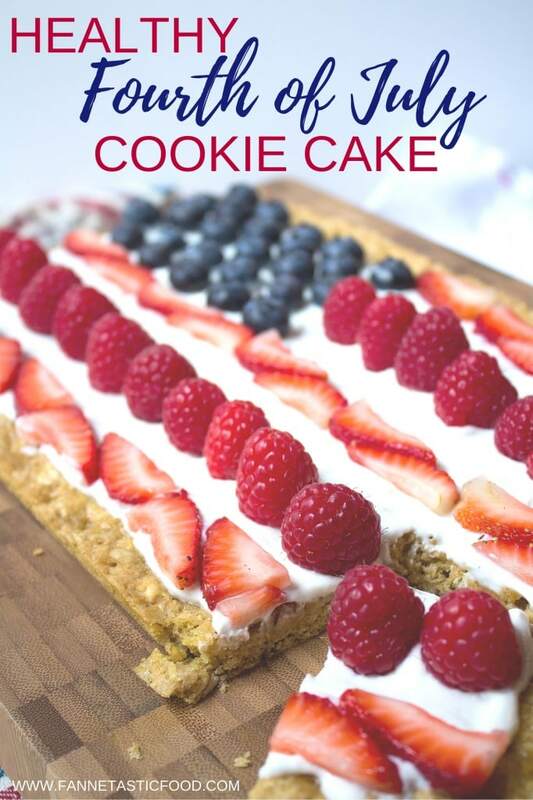 I love festive 4th of July cakes that pop with color like this one. I saw the picture you posted yesterday and have been waiting for the recipe. Thanks! I can’t wait to share it on our company Facebook page too. I’m always looking for great high fiber options to traditional sweets. Enjoy! Thank you for sharing! This looks wonderful! Can I use the Quaker 3 minute quick cooking steel cut oats? I’d recommend rolled or old fashioned here. .. steel cut texture is quite different, although I haven’t tried the 3 minute ones! Wow! Looks super! Happy 4th! Yum! I bet whipped coconut cream would be a good sub for the yogurt too! I should’ve! I was the one who kept exchanging looks when that guy made that weird intercom speech! Ah! That was seriously hilarious – he kept coming back for more! So bizarre.